Le Pèlerin illustration of the burning of the Custom House. | Come Here To Me! « Reminders of ‘Fortress Fownes’. Le Pèlerin illustration of the burning of the Custom House. On 25 May 1921, Dublin’s magnificent Custom House was set ablaze by the 2nd Battalion of the Dublin Brigade of the Irish Republican Army. The centre of Local Government for the British administration in Ireland, the building was of enormous political and symbolic importance. We had the building practically at our mercy. And I can tell you now that many parts of it that were not on fire when we entered were blazing nicely in a short while. For the IRA, the ICA and indeed the DFB, it was all in a day’s work. Five Volunteers were killed that day, and dozens captured, but the images of the destroyed Custom House which would make their way across the world did much to counter the lies that the war in occupied Ireland was little more than unarmed policemen being shot by thugs. The capacity of the revolutionary forces was clearly demonstrated before the world, in a way that was totally at odds with the cinema newsreels of 1921. 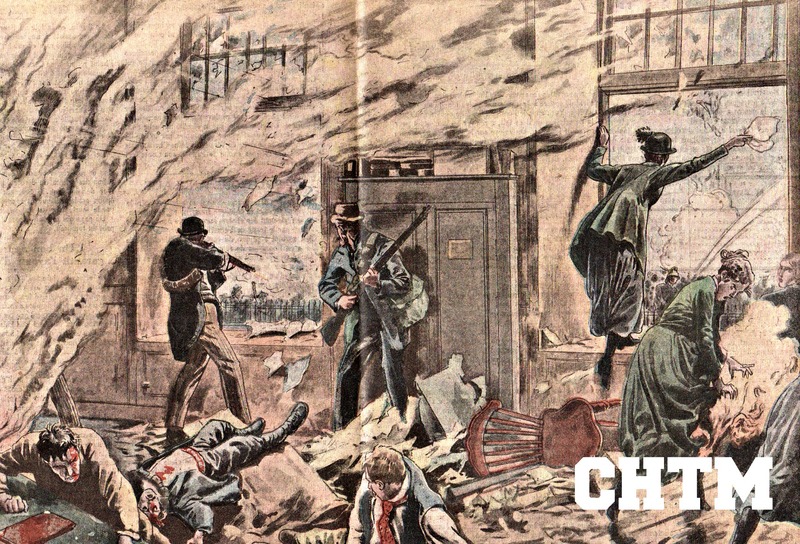 In France, this imaginative illustration appeared in the pages of Le Pelerin days after the burning of the Custom House. A few things should be noted; perhaps the illustrator was thinking too much of the events of 1916, as the scene is more reminiscent of the GPO than the reality of the Custom House. While men entered the Custom House armed with revolvers, here we see rifles being fired out of the windows. Note also the presence of women, perhaps Cumann na mBan activists, one of whom has had the misfortune of having her dress catch fire! Looking out one window, we see a Dublin Fire Brigade firefighter hard at work too, pointing his hose inside the inferno. It’s quite funny to think, owing to recent historical research and revelations, that may be the most ludicrous or inaccurate dimension of the work!